Texas loves big stories about itself, and nothing reads bigger than the ups and downs of its most famous entreprenuers. In The Big Rich, Bryan Burrough sketches out the colorful stories behind Texas' "Big Four" oilmen: H.L. Hunt, Clint Murchison, Roy Cullen and Sid Richardson. 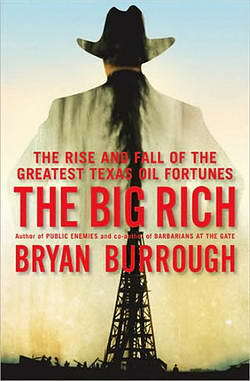 In the book's introduction, Burrough makes a point of noting that he grew up in Waco, but has spent his adulthood in New Jersey. It is obvious he feels this to be an important disclosure. Reading The Big Rich, one wonders if this is more disclaimer than confession, shielding a kind of guilt or conflict about his home state. Beginning with the original discovery of oil at Spindletop in 1901 near Beaumont, Burrough follows the trail of discovery of the Lone Star State's rich natural resources. These first biographical chapters focus mostly on historical information, and they are the book's strongest. He introduces the first of the Big Four, Roy Cullen, the tall fifth-grade dropout who studied geological maps carefully to the point that he sold oil leases to others, but finally struck it rich on his own around Houston. More interesting are the less known histories of Sid Richardson and Clint Murchison, originally childhood friends from Athens, Texas. Each of these men separately developed oil wealth within the thousands of square miles between Fort Worth and El Paso comprising the largely overlooked and undervalued area of West Texas. After dry holes and setbacks in the 1920s, they discovered enormous oil resources and the wealth that went along with it. Richardson and Murchison stayed lifelong friends, but also developed a new network of friends among other newly rich oilmen in Dallas -- a fairly exclusive society where drinking, cursing, poker and always keeping an eye out for the next lucrative business deal were the norm. The most colorful of the four is unquestionably H.L. Hunt. Burrough presents in great detail the man's start in East Texas, his steps to creating the legendary Hunt oil fortune, and the multiple wives and families he maintained for years. Hunt's personal story, along with his unapologetic bigamy, makes for lots of soap opera in the book. Later chapters detail Hunt's numerous offspring fighting over his immense estate. When Burrough gets into the ups and downs of the Big Rich during the Depression, things start reading like inside baseball. Many of these oilmen were quite secretive, especially Richardson. Had they lived today, they would never have twittered or kept a public profile on Facebook. These guys were all poker players by nature, and they knew the importance of holding their cards close to the vest. Burrough does succeed in revealing many details about their activities which never before have been brought together. During the 1940s, things turned out pretty well for the Big Four. Their companies were able to slake the immense thirst of the U.S. Military during World War II at great profit. After the end of the war, these men were newly minted titans. It took some time for the press and other big business to fully comprehend how much money these men were worth. But once the smoke of war had cleared, these titans stood out plain as day. At this point began the criticisms and complaints -- many valid -- but they do reveal the author's own lens. Once the Big Four had secured their respective fortunes, the biographical sketches become negative, which is where the author runs into some trouble. When it comes to politics, Burrough uses the labels "conservative" and "ultraconservative" interchangeably. This blur puts Burrough on thin ice, particularly when he's drawing lines out to today's George W. Bush and the current Texas-dominated Republican Party. Burrough details the vanity political projects of Roy Cullen and his friend John Henry Kirby, and their strident, anti-Communist leagues filled with John Birchers and aging Klu Klux Klansmen. These men were vociferously opposed to Communism, including all of the overreactions of the time. Looking at things in context, President Truman opposed the Soviet Union enough to send U.S. troops to South Korea (to the oppostion of many Congressional Republicans). There certainly was hysteria about Communism in the 1940s and 1950s, as typified by Senator Joseph McCarthy and the House Unamerican Activities Committee hearings. During this time, the Soviets were enveloping countries, like Hungary in 1956, in bloody shrouds. Also, Russian documents declassified in 2006 have revealed that Julius and Ethel Rosenberg actually were on Nikita Khrushchev's payroll, supplying information regarding the development of the nuclear bomb. There were some very dangerous threats. The anti-Communist projects of Roy Cullen and others distract Burrough from one of the most significant historical events critical to Texas politics during this time. In the over 400 pages of the book, there is no mention of the Tidelands Oil Controversy. The 1947 Supreme Court Tidelands case ruled all off-shore territory as federal land, and not the states'. This decision immediately turned Texas oil against the Truman administration. The issue was so significant that Eisenhower specifically promised in his 1952 presidential campaign to return the tidelands to state control. This issue resonated so strongly, Eisenhower carried Texas in the election, the second Republican ever to do so. In the chapter "Troglodyte, Genus Texana," Burrough details a story describing Sid Richardson's alleged desire to place Fort Worth lawyer Robert B. Anderson on Eisenhower's presidential ticket as vice president in 1956. Richardson was close to Eisenhower and had been a huge financial donor to his campaign (and seeing this in terms of the Tidelands case, it makes sense). At several points Burrough puffs up Richardson's involvement in Ike's decision making. Here again, Burrough fails to mention that Anderson did not want to be Vice President because, like most Texans at the time, he was a Democrat, a fact explained in Eisenhower biographies. Anderson did end up as Eisenhower's secretary of the treasury in his second term, which makes the reader wonder why the author tried to frame this story as Richardson strong-arming Washington to achieve a desired outcome. During this time, the Big Four were always fighting with the Federal Power Commission, a Herbert Hoover-era regulatory agency that for decades set the prices for natural gas. Here again, this was of significant importance to the bottom line of the Texas oil and gas industry, and it would have been nice to at least point out that, under this regulatory structure, dirty lobbying was inevitable, drawing the energy business into Washington D.C. like a magnet. And we could also observe that Jimmy Carter and Ronald Reagan deregulated oil and gas prices, and eliminated import quotas in their administrations precisely to save us all from this inevitable political gamesmanship, questionable money and unending dirty pool. Burrough explains the details of Hunt's dashed hopes when Mummar al-Qaddafi nationalized his oil operations in Libya in the early 1970s, and later how sons Nelson Bunker and William Herbert failed to corner the silver commodities market years later. Burrough's account of the rise and fall of Glenn McCarthy, his Shamrock Hotel in Houston (which was the inspiration for the Jett Rink character in Edna Ferber's classic novel Giant) is one of the book's high points. On the whole, The Big Rich contains many good stories illuminating many men who became part of Texas legend. The author does not attribute business or operational skills to the oil magnates. Rather, he makes no mention of neither these skills nor abilities related to discovery and production of oil and gas. Reading this, one might think that just anyone standing in the right spot at the right time would have produced identical results. There is good reason why the United States so successfully capitalized its natural resources during WWII which led to the defeat of the Axis powers. It is still a technological marvel that, after all these years, resourceful and inventive oilmen continue to produce oil and natural gas from beneath the Texas soil, despite fears that these resources would have been depleted years ago. In contrast, many countries of the world, such as Mexico, Venezuela and Ecuador, struggle to continue their dwindling oil and gas fields. The difference is that these countries never had the Big Rich.